Three weeks after Katie Hewson’s benefit, everyone is still talking about how awesome the Class of ’94 is. That is a given, but what happened on November 2, 2007 will be remembered for ages to come. While the night was a success, the Class of ’94 totally stole the show. Of the 389 people who showed up, 70% were from our class. The stats from the benefit speak for themselves. And finally, the respect of his peers (priceless). Pirani himself was the lucky winner of a Wachusett Class of ’94 Beer Koozie. “Unlike other koozies, this koozie does the job time and time again,” Pirani said as he pounded a Wachusett Ale. Roberge agreed. He explained that any time you invest in the Class of ’94, the return is ten-fold. By contrast more conservative investments, like government bonds, only offer a five-fold return on investments. “Would you rather make ten-fold or five-fold?” Roberge asked sarcastically. Forty said his strategy was simple. 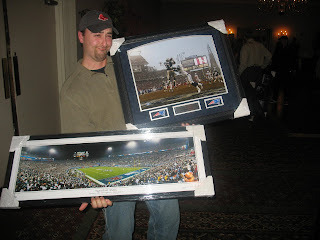 He boxed out, made sure he had inside position, and used his downfield speed to submit 23 successful silent auction bids. Another strategy: “Simply write your initial. I wrote “F” for Forty so I wouldn’t be bogged down by writing my name,” he said. Forty’s 23 items and 77 percent success rate is not only a record for our class, but a record for silent auctions in the United States. As many of you know, silent auctions are not held in foreign countries, but this will soon change. “I am heading to Europe next month to speak with the E.U. about possibly implementing silent auctions everywhere, especially class reunions,” he said.